In time, we all show our true colors. My colors are about to show that I am a bit crazy. Really, I blame my husband who bought me awesome trail runners and a copy of Trail Running Magazine for Christmas. I’m completely obsessed with the idea of running The Rut which is a 50K ultra trail marathon held in September in Big Sky, MT. Registration opens on January 5th and you can bet I’ll be sitting on that one. Probably the thing I am looking forward to most is training for it. Oddly, I am excited to practice running on steep hills and rocky terrain. Training for The Rut has got to help make me faster for a flat road marathon I would think. 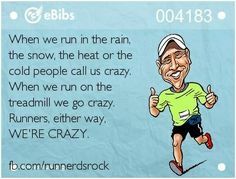 I also think it will help take some of the dull out of marathon training. For my first ever runners tip!!! Chapstick as Body Glide: I usually keep a tube of chapstick in my hydration belt when I’m on a long run. But typically, hydro belts have limited space and you can’t fit a stick of Body Glide with the myriad of other items you must carry on a long run. On a run earlier this year I started to chafe on the underside of my arm where it rubbed against my singlet. After going through this torture during my marathon (link to marathon blog), I didn’t want to live through the torture again so I grabbed my tube of chapstick and used it in place of Body Glide and what do you know? It worked awesome. Of course, I will never use it on my lips again but I now have a permanent and easily portable tube of lubricant for emergencies. What’s the longest you’ve ever run? Any great running tips to share? Why they don't make tiny body glide is beyond me, but this is a great idea! Do the rut! it sounds like it has a lot potential for inspiration. What a great husband, by the way! Great gifts!